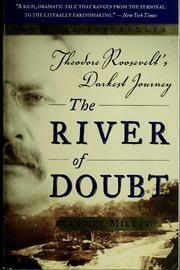 The River of Doubt: Theodore Roosevelt's Darkest Journey by Candice Millard. Anchor, 2006. Hardcover/Hardback. 466 pages. I love reading nonfiction, but unfortunately I often have a hard time finding nonfiction that really grabs me and pulls me into the story itself without getting bogged down by dry information. It's important to me that the author is able to incorporate all of the facts in an interesting manner that is actually able to grab my attention. The River of Doubt did just that and more, and I immensely enjoyed this story. I initially picked up this book because I was sent an ARC of Millard's upcoming release on Winston Churchill, The Hero of the Empire, which I read and loved (and will be posting a review closer to the release date), and I knew I had to read more work by Millard - in short, she's a brilliant writer. I don't claim to be overly knowledge of Theodore Roosevelt, but I always thought I at least remembered the basics of his life from various classes in school and other books I've read about him. Apparently what I knew of Roosevelt was rather sparse, however, because I had no idea that he explored an uncharted river in the Amazon that ended up being an entirely dangerous and insane trip. What I loved about The River of Doubt was how much it endeared Roosevelt to me; when I closed the book, I felt like I was losing a friend. That might sound odd, seeing as he wasn't an overly warm and fuzzy man, and was in fact a bit egotistical and sometimes arrogant, but that's how well Millard wrote about Roosevelt's journey. She showed all sides of him in complete honestly, which revealed not only his flaws, but also his kindness and appealing aspects. I found his strength and seemingly endless perseverance to be incredibly inspirational. I won't lie, though, it also made me rather frustrated that Roosevelt was so stubborn about deciding to undertake this dangerous hazard of a trip in the first place - there was obviously not nearly enough planning or precautionary measures taken to prepare. There is a lot of information in this book, but somehow I never felt bogged down by it. The beginning is fairly slow to start, but it's still full of interesting information. Millard spends an abundant amount of time discussing the various preparations and planning the occurred for the journey, as well as some pre-journey events once Roosevelt landed in South America. But I promise all the background information pays off; this knowledge of pre-departure events really helps to understand the nature of the journey and where things went wrong. There were also some smaller, more minute details that Millard included that I really enjoyed: for instance, when she described how much a person was being paid for a service, she would then list, in brackets right after, how much money that was equal to with modern day inflation adjusted. This really helped give me perspective on various elements, as well as showed Millard's intent to make sure her audience truly understands and can relate to what she writes. Similarly, she goes into great detail on many of the insects, animals, plants, and indigenous peoples that inhabited the areas in which the crew explored, which really helped to put the entire experience into a more understandable context. It made the dangers that much more real and added a lot of intrigue and risk to the story; I felt like I was right there in the jungle with the rest of the crew without, of course, actually having to endure their hardships. It is obvious that Millard spent endless hours researching and carefully constructing this book. No detail is overlooked and no fact is left unsourced. This is an incredibly exciting adventure story, and I would highly recommend this to anyone who wants to know a little bit more about Theodore Roosevelt, or even just someone who wants to read about a daring, perilous, and all-around exciting exploration story. Overall, I am giving The River of Doubt five stars for its wonderful detail, story, and extremely well-written writing.